I got a pass to see this film today, and was decidedly impressed. 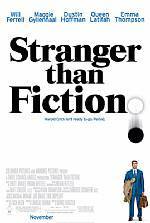 Stranger Than Fiction takes a different approach than the trailer suggests, but I was quite happy with it. Emma Thompson is quirky and fantastic, and Will Ferrell is subdued and charming. It's a story about fate, interconnectedness, and stories themselves, and it offers some interesting questions to ask yourself. I would highly recommend it to my English Literature-studying friends and those that appreciate a good story. I give it a 3.5/4. Not brilliant, but I'll probably see it again and, when I can, buy the DVD. Also Playing (that I've seen) are such films as Borat, The Departed, Marie Antoinette, and The Prestige. I recommend the lot of them, and suggest you read more about each film. Conveniently enough, I've written you some spoiler-free stuff to read. I had gone to this one excited, but basically expecting to see an extended Borat segment, similar to what I'd seen on "Da Ali G Show." The film, however, covers a much broader range of comedy, such that I'm still kind of wondering what exactly I saw. The first and biggest surprise is that the film actually has a plot, and is not some random string of Borat interviews. If that's what you were hoping for (that is, you were a gigantic fan of Borat and were looking forward to more of the same), I think the movie will disappoint. If you're going into this fresh, I think you'll like it. Just please, if you ever plan on seeing this movie, go now. It won't be long before most all of the jokes are recited to death... it might already be too late. 3/4. I saw it opening weekend and some of the jokes were already a little stale. I'm just bitter. It was a very good comedy. The oldest of the movies I'm discussing, but I think also the best film I've seen this year. I'm not a Scorcese follower but I've enjoyed some of his stuff. I think this one does some amazing things with the material; I was shocked to learn it was based on a Hong Kong screenplay (Mou gaan dou). Scorcese makes the story his own, and the actors do amazing things with the material; there is no weak performance in this film. Granted, the film is depressing. I think the title gives that much away. Don't go in expecting to feel overly optimistic later. 4/4. If Scorcese doesn't get his Oscar, I'm going to go She-Hulk on the Academy. I'd been dying to see this since I first saw the trailer, given that I love pretty costume dramas, this period of French history, and Sofia Coppola. I was extremely pleased with the end result, and would recommend it to fans of Coppola's who aren't all that picky about the particulars of history. Time is fluid, dialogue is sparse, plot is minor, and Versailles probably plays a bigger role than Kirsten Dunst in this film. If the film is really "about" anything, it's Versailles's corruptive and deluding influence on Antoinette and her court, resulting in the revolution. This message, however, is conveyed only in brief segments between interludes of gowns, wigs, cakes, parties, opera, and lapdogs. 3.5/4. Not quite perfect, but you can bet that I've been listening to the soundtrack since I saw the film and I'm going to be getting this sucker on DVD as soon as it's available. The beginning of the film is pretty much everything you need to know. Almost every event in the plot is simply a variant of that one scene, and the trick is simply how (trust me; the movie is twisted enough that this is no kind of spoiler). I was very excited about this one, and enjoyed it a lot. The layered narrative, great cast, and convoluted plot make it quite a ride. There's not a whole lot I can tell you without giving something away, so I'd just suggest going to see it if you have any interest. It'll probably hold out pretty well on video, but it won't sweep you away quite so much outside of a theatre. 3/4. Thought it was great, but some of the logic eludes me and certain elements seem a little contrived, but it's led to some good discussions.